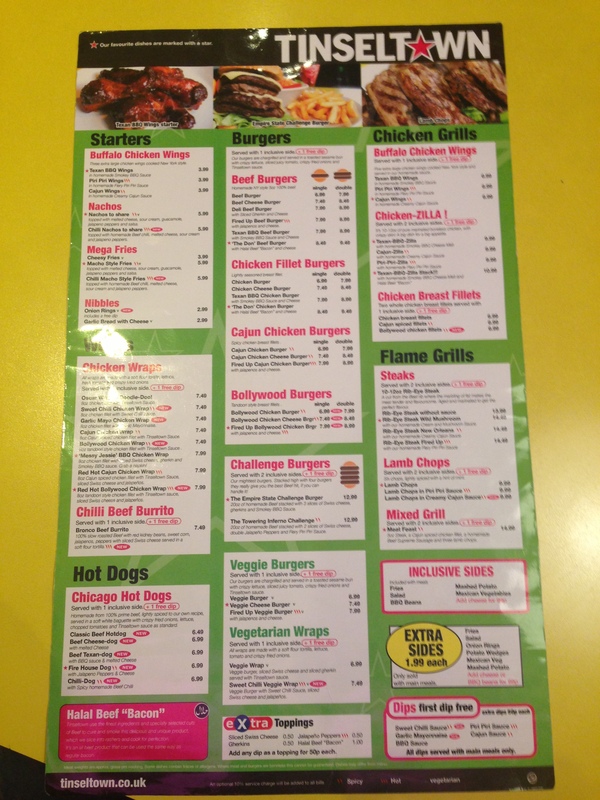 Tinseltown | Restaurants of the World Unite! There are plenty of places that claim to have the best burgers in town, which is a claim as tiresome as it is ubiquitous. Burgers can be revalatory but for me it’s about context: Home made, in a back garden over the BBQ, nothing is better. Sweaty in a joyless restaurant; or worse, Sunday in gastropub surrounded by glands in red trousers, heaving with dickish extras like avocado or blue cheese so you can’t taste the meat. 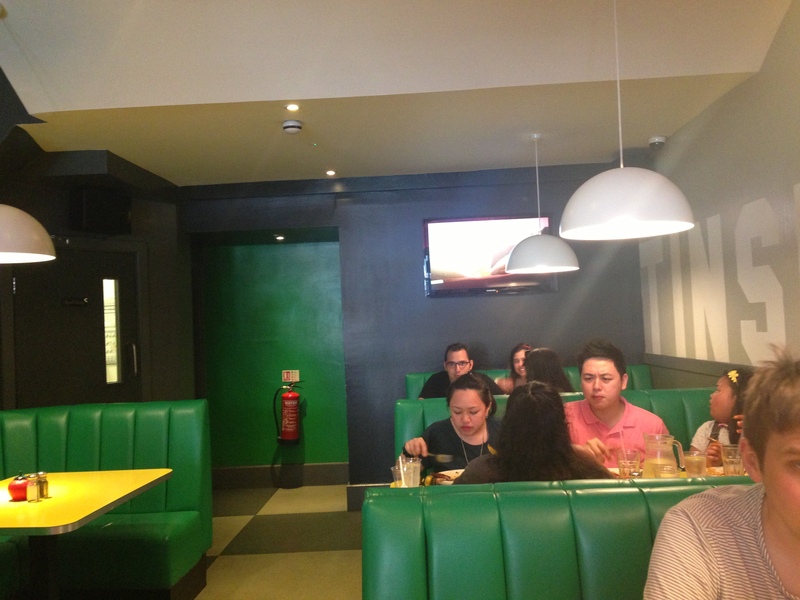 Tinseltown (http://www.tinseltown.co.uk/) wisely doesn’t claim to have the best burgers in town. They’re not. But the burger is good and does what it is meant to do. It is uncomplicated, basic stuff and beats fastfood and it’s not massively pricey. 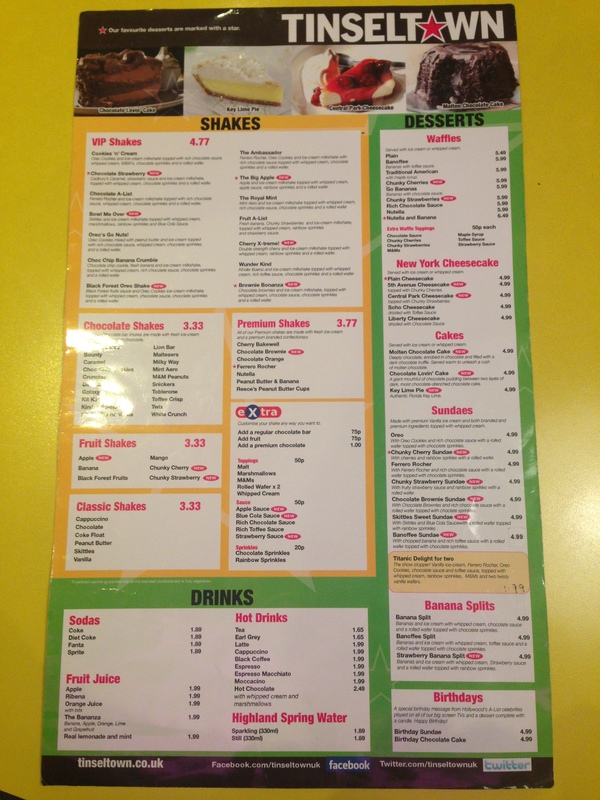 It is an American themed diner, with branches in London and elsewhere, with head-banging MTV and pictures of Hollywood stars mounted on the wall cut out from old editions of Hello (the Cruiser moved on from that deadweight Holmes yonks ago I thought?). (1) Challenge Burgers. That’s right. 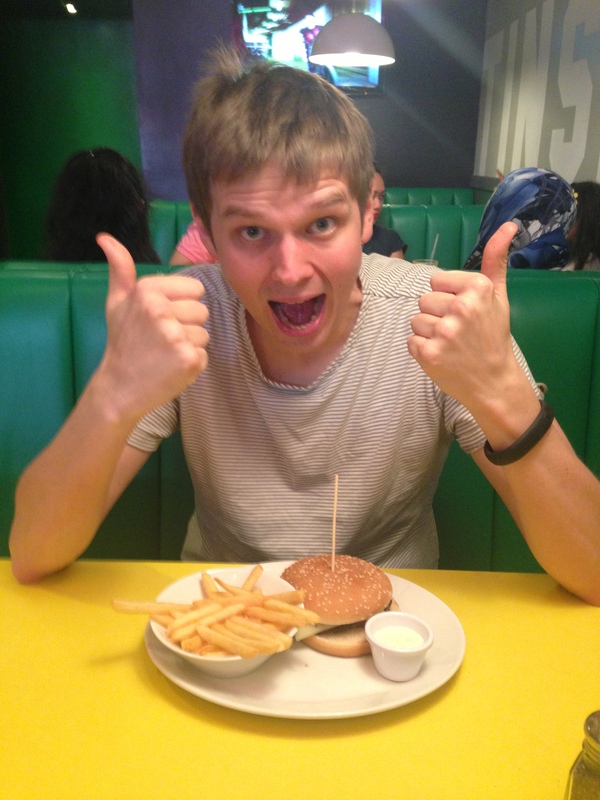 Where else in London can you tackle food like an assault course? The Empire State Challenge Burger and the Towering Inferno Challenge offer 20oz of beef plus all the trimmings. Clay up your left colon with 4 burger patties AND recreate the comedy stylings of the unctuous dinotwat from Man vs. Food for only £12.99! (2) The milkshakes. Monty enjoyed the coke float (not the copraphiliac treat), but there was a spectacular array of milkshakes on offer which I’m going to have to try in autumn. 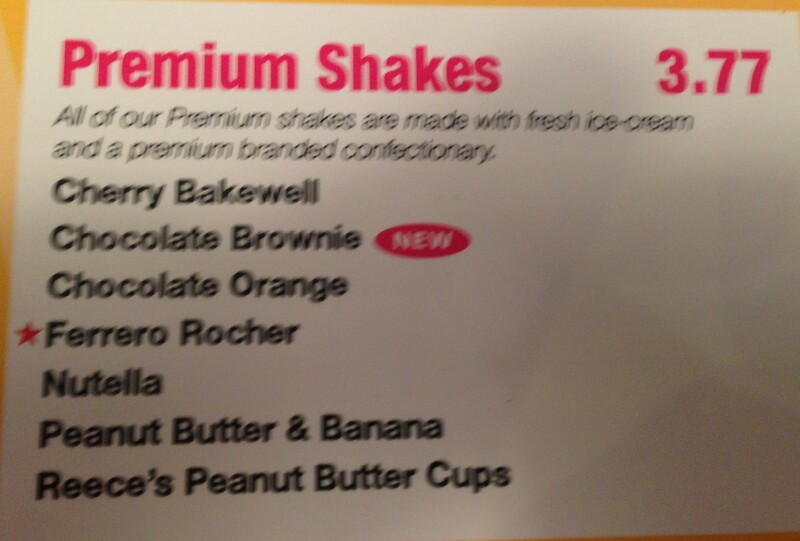 The Cherry Bakewell shake will be first in line. A milkshake in these temperatures can’t be a good idea. Masses of American themed restaurants in London, but I can’t get terribly excited about them. It’s hardly a refined cuisine, it’s more about the experience. All Star Lanes (http://www.allstarlanes.co.uk/) and Bloomsbury Lanes (http://www.bloomsburybowling.com/) are the sorts of places I mean. Basically I enjoy bowling. And after I’ve vanquished my foes on the maple, I like to celebrate by gorging on a pizzadog and slaw. That’s coleslaw, but by dropping the cole you save masses of time when saying it. Apart from when you have to explain slaw to the uninitiated. 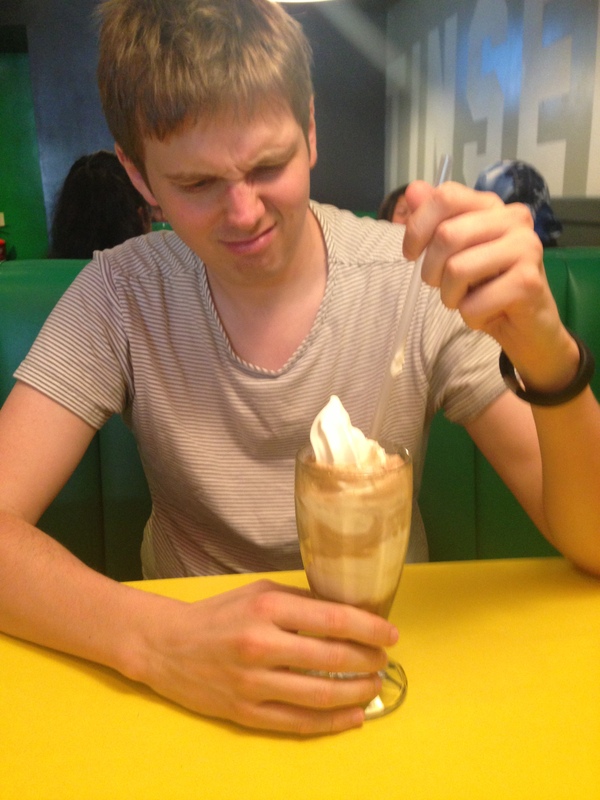 It’s not the coke float he thought he ordered. One of the few pictures that paints fewer than a thousand words.